Ahhhh, Christmas, the time of the year when gift giving is plentiful and the worries about spending too much money are put aside. Some time in November my partner and I were shopping at Nordstrom and we were given a spritz of the new Creed Royal-Oud scent. I liked it, but at $300 a bottle, I didn’t think I liked it all that much. My partner really loved the scent, so I decided to surprise him with it for Christmas. I have found in the past that Creed fragrances typically don’t wear well with me, so I have held back from them in the past. But the first time my partner put this on, I absolutely loved it on him. It goes on very green and woody, but as it dries it warms and has more of a light musk smell. It smells expensive, but I’m not sure it smells $300 expensive and I can’t tell if it’s long lasting or if I my nose just easily become accustomed to it. But as long as my partner is happy with it, so am I. Wood, leather marble and gold,” elements of a royal Persian palace, inspire Olivier CREED, sixth-generation master perfumer of France, an architect of fragrance, to create new Royal-Oud for men and women. Rare, hypnotic, sumptuous oud, an ingredient coaxed from Agarwood trees of India –- and more costly per ounce than palladium –- lends its power to this blend. CREED Royal-Oud gives the contemporary American man and woman a touch of the splendor of palace life, Persian and Parisian™. Characteristics: Universal and modern. Luxury both Persian and Parisian™. Top Notes: A crown of Calabrian lemon, pink berry and Sicilian bergamot. Middle Notes: Cedar, galbanum and angelic root. Base Notes: Regal Indian oud, sandalwood and Tonkin musk. 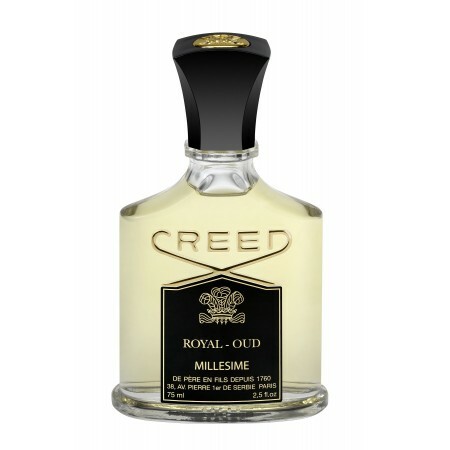 Categories: Creed | Tags: 4 bones, creed, creed fragrances, expensive, masculine, woody | Permalink.